Many patients and perhaps surgeons alike are confused and believe that the face lift and neck lift are two separate procedures and can be considered or performed individually. This is why we sadly see some results in the press of people with tight faces and sagging necks despite the neck being one of the most sought after and important areas to rejuvenate in facial ageing. 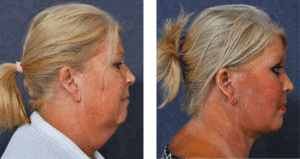 In fact, in carrying out a full facelift properly, the ageing of the neck “must be addressed. The face lift and the neck lift are one operation with more emphasis on the different areas of individual ageing: the neck if you have serious jowls or platysma bands /turkey neck, or the mid-face if you have sagging or laxity in the cheeks and area under the eyes. Just as each patient ages differently, the approach to surgical rejuvenation has to considered differently for everyone and customised to give a natural enhanced look after face lifting and other facial rejuvenation procedures such as eyelid surgery, browlift and skin resurfacing for lines and discolouration. I recently had an opportunity of visiting two leading surgeons in Britain, Dr Charles East, the premiere rhinoplastic surgeon in London and Dr Peter Hodgkinson, a renowned cleft lip and palate surgeon in Newcastle on Tyne. I have heard Charles speak many times and been on the same faculty as him in the past. I spent an exciting day with Dr East at The London Clinic assisting him in the operating theatre on three most challenging cases which he performed in an exemplary manner. palate lip procedure. We spent an invigorating day discussing the intricacies of this operation and Peter is intending to join me and our Operation Restore Hope team for our charity’s next mission to the Philippines in 2019. In a coincidence, not long after meeting Peter at a conference in Sydney and prior to visiting him in Newcastle, I had a patient of his on whom he performed a very successful cleft lip procedure as an infant present for cleft revision rhinoplasty. Being able to share this patient’s journey as colleagues across the world was as bonding as having the same family name. Peter will be a great addition to the mission and generous colleagues like Peter andCharles who share their work allows us all to continue to grow and develop as surgeons. Dr Hodgkinson welcomes the opportunity to teach international surgeons and also to have the opportunity to learn a great deal from them. Most recently we have had two such visitors, Dr Kathy Nunez, one of our prized cleft surgeons from PCMC in Manila and Dr Linawati Makmur from Jakarta, Indonesia. Dr Hodgkinson and the team are always honoured that these international visitors make their way to Sydney and welcome the opportunity to teach and learn from our plastic surgical colleagues. The Double Bay Day Surgery (DBDS) is audited every year by the NSW Health Department to their licensing standards as well as by Accreditation Bodies to the NSQHS (National Safety & Quality Health Standards) and ISO9001. Once again DBDS was given full marks for its compliance with all requirements. The Double Bay Day Surgery continues to be the premiere private hospital dealing solely and purely with plastic surgery and cosmetic surgery and has a enviable record of performance and outcomes. In addition to all the safeguards put in place to meet or exceed all standards, an essential ingredient to eventual complication free outcomes is patient selectivity. Patients who are selected for any form of elective surgery should be classed as ASA 1. This means that they have to be well enough to pose a very low anaesthetic risk. Our anaesthetists, who are all experienced in cosmetic plastic surgery review all patients preoperatively. Remember that all cosmetic surgery must now be carried out in licensed and accredited facilities with an anaesthetist present whether the surgery is under general anaesthesia or twilight sedation. We are proud that we have always worked to these and even higher standards since opening our doors over twenty years ago. What is it that you don’t like about your nose? There is a common misconception that patients who present for a rhinoplasty (nose reshaping surgery) all have noses which they think are too big for their face. In fact, nothing could be farther from the truth. The nose is not only a defining feature which gives the face balance and character as its central element but is itself comprised of many aesthetic elements. All of these need to be in harmony to create a pleasing appearance of the nose and of the face. In addition, the nose has the function to assist in smell and therefore also taste, as well as breathing and hence wellbeing including fitness, sleep and general health. There are several major aesthetic areas of the nose, each of which can require correction for an optimal result, either by itself or in conjunction with the other aesthetic elements. Rhinoplasty is one of the most complex surgical procedures as the surgeon must deal with multiple complex aesthetic and functional units, not to mention a large variety of tissue types from bone, cartilage, and mucosa to skin, all in complex shapes which require support. When seeking out rhinoplasty surgery, make sure that your surgeon is an expert with many years of experience in both cosmetic and functional rhinoplasty. Dr Hodgkinson has over 30 years experience and is one of only two surgeons in Australia to be invited to be a member of the Rhinoplasty Society, a group of international rhinoplasty experts. Textured or furry silicone breast implants are being re-evaluated worldwide. The dramatic fall in their usage by plastic surgeons is due to the fact that there is a rare cancer, Anaplastic Large Cell Lymphoma (ALCL) associated with this implant. There has been no occurrence found in relationship to smooth saline breast implants. A further problem with potential diagnosis for silicone implants is the incidence of “silent rupture”. The patient may not be aware of a leak in their silicone implants until a granuloma or capsule forms and is palpable. The implants can be ruptured and slowly leaking silicone into the patient’s tissues for a protracted period of time unless the patient either has costly regular diagnostic tests to detect leakage. Ultrasounds can be a useful first port of call diagnostic test but can give false negatives and miss the leakages that are best detected by costly MRIs. Generally, Dr Hodgkinson prefers to use saline breast implants. The saline implants are appropriate when the patient does not want to be too large and if they do not have a bony chest wall or are too thin. For patients who want a larger look, a smooth walled silicone gel implant can be used which does not have the textured surface and associated very rare possible complication of ALCL. Dr Hodgkinson at mission with baby and mother preop. Operation Restore Hope (ORH) is going full force with new initiatives and dates set for our 2019 mission. In addition to our ongoing missions, follow-up clinics and surgeries performed throughout the year, we have been responding to requests for equipment that help make not only other missions possible but better patient care available. All this has been in conjunction with our partners the Philippine Australian Medical Association (PAMA) and Ugnayung Ng Pahinungod at Philippine General Hospital. One such initiative was sourcing 30 hospital beds from Westmead Hospital and getting them to Alabat in the Philippines, which has a small regional hospital which was limited by its lack of beds. Another has been donating an anaesthetic machine to a burns unit in larger metro Manila hospital where there were anaesthetists but no machine. We continue to collaborate on cases throughout the year at the Philippine Children’s Medical Center (PCMC) and are assessing a potential additional mission site in northern Manila where we have been asked to conduct a pilot mission. Via the charity we are also privileged to have plastic surgeons and plastic surgical residents from overseas come to visit and spend time with us at the day surgery and clinic in Double Bay to observe the variety of plastic and cosmetic surgical procedures that Dr Hodgkinson performs.